The land of mills and small-scale industries, Solapur is a historic city in Maharashtra and has developed into a significant tourism centre in the region. Today, it is one of the largest and fastest-growing cities in the state and is famous amongst tourists for its temples and ancient places. However, it is also popular for its cotton mills and bedsheet and towel making factories. Regarding history, Solapur has a significant place in the chapters of the Indian history. It is the birthplace of several national freedom fighters who sacrificed their lives during the Indian independence movement. Solapur is also sometimes referred to as the city of martyrs. If you would love to explore such an amazing destination which is home to historical as well as religious sites, then plan a tour of Solapur this weekend. Read on to know more about Solapur, its tourist attractions and how to reach it. The region in and around Solapur experiences an extreme type of climate, and hence it is advisable to not visit it during the summer season when the climate is too hot. The best time to visit it is from October until the end of February as this is the period when the beauty of the city is at its peak on account of a favourable and pleasant weather. By Air: The nearest airport to Solapur is located in Pune at a distance of about 256 km. If you desire to travel by air, you can take a direct flight from Hyderabad to Pune and then from there, you can hire a bus or a cab to reach Solapur. By Rail: Solapur is well connected to Hyderabad and all other major cities by rail. You can take a direct train from Hyderabad to Solapur. This rail journey will take an approximate time of 6 h.
By Road: Being one of the significant cities in Maharashtra, Solapur is easily accessible by road. You can either hire a cab or catch a direct bus to reach Solapur from Hyderabad. As route 1 is the fastest and will reach your destination within 6 h 30 min, i.e., 1 h lesser in comparison to the other route, you must take route 1. On your way, you can take a break at the following destinations. These places are known for their historical as well as well natural attractions. Let's find out more about them. Basavakalyan is located at a distance of about 195 km from Hyderabad and 125 km from Solapur and is famous as a historical town. It is the place where you can capture the beauty of the world's largest statue of Basavanna, a spiritual guru after whom the town is named. As it has a history stretching back to 3000 years, you can find several ancient monuments and sites here. The major places to visit here include Basavakalyan Fort, Basaveshwara Temple, Shiva Temple and Anubhava Mantapa. Another beautiful stoppage on your way, Naldurg is a small town which is commonly famous for its beautiful fort. Even though Naldurg Fort is lying in ruins, it is still a major weekend destination for locals and history lovers. The town is also home to several Hindu temples. It is located at a distance of about 267 km from Hyderabad and 45 km from Solapur. Once you are within the boundaries of Solapur after covering a distance of about 310 km from Hyderabad, you can visit the following places to enjoy the best of Solapur. The list includes historical, natural, as well as, religious sites. Therefore, it wouldn't be wrong if we say that Solapur caters to the need of every kind of tourist. 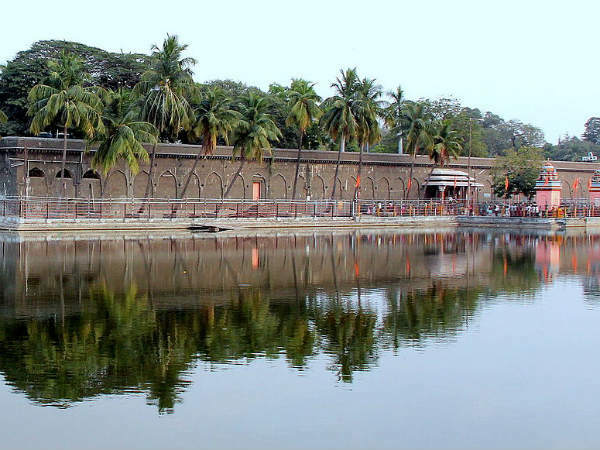 The most popular and most frequented place in Solapur, Siddheshwar Temple was constructed in the honour of Siddheswar, who was one of the greatest devotees of Lord Shiva. Every year, the temple is visited by tourists and Hindu pilgrims from all over the state. During the festive season of Makar Sankranti, the temple remains flooded with thousands of people. The presence of a small beautiful lake within the temple compound makes it a relaxing and rejuvenating destination. If you are looking forward to exploring the history of Solapur, then Solapur Fort should be on the top of your bucket list. Even though most of the fort structure is in ruins, it still allures hundreds of visitors every month. It is surrounded by a beautiful green garden and is known for its splendid architecture. Pandharpur is another pilgrimage destination which can be accessed from Solapur. It is located at a distance of about 70 km from Solapur and is a destination for those who always look forward to savouring a divine atmosphere. The town is located on the banks of the Bhima river and is known for Vithoba Temple, which is one of the most visited temples in the state. If you love to just sit and laze by a beautiful waterbody, then Sambhaji Lake in Solapur is your calling. It is one of the few places in the city where you can feel yourself relishing a peaceful and composed environment. Other places in and around Solapur which might interest you include Akkalkot Swami Maharaj Temple, Great Indian Bustard Sanctuary, Ajoba Ganpati Temple and Tuljapur.